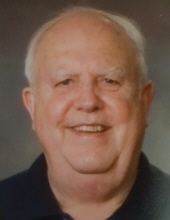 Irvin “Irv” Otis Loock, 80, died suddenly on Wednesday, November 21, 2018 at his winter home in Walnut Creek. Irv was a resident of Cleveland, New York. Irv was born in Amery, Wisconsin on April 29, 1938 to the late Irvin Martin Loock and Serena Kobs Loock. He was a retired senior central New York sales representative for Andersen Windows with over 40 years of service. An avid outdoorsman, Irv was a member of Ducks Unlimited and the German Gun Collectors Association. Irv proudly served his country in the United States Navy. Irv had a wonderful sense of humor. He was a good friend, a great husband and father, and had a generous heart. Irv loved fishing, hunting, woodworking and his dogs, German Shorthaired Pointers. Most importantly to Irv was his family. Irv worked so hard to make sure his wife and children were well taken care of. Irv adored his wife and his daughter had him wrapped around her finger. He will be missed but greatly remembered. The family will receive friends on Tuesday, November 27, 2018 from 10:00 – 11:00 a.m. at Seymour Funeral Home followed by a service to celebrate Irv’s life at 11:00 a.m. with Rev. Andy Stovall presiding. Irv will also be remembered in the spring at a memorial service in New York. Irv is survived by his wife of 55 years, Valerie Loock; children, Lance Loock and Sandra Loock (Zollie Kornegay); and grandson, William Julius Loock. In addition to his parents, he was preceded in death by his sister, Jean Brown and his best friend and brother, Elwood Engelbrekt. In lieu of flowers, Irv would request for you to vote Republican in 2020. To send flowers or a remembrance gift to the family of Irvin Otis Loock, please visit our Tribute Store. "Email Address" would like to share the life celebration of Irvin Otis Loock. Click on the "link" to go to share a favorite memory or leave a condolence message for the family.